Beijing’s One Belt, One Road (OBOR) initiative appears to be an important part of its burgeoning ties with Moscow. When an arbitral tribunal ruled overwhelmingly against China on the Philippines’ South China Sea case against Beijing, it dealt another embarrassing blow to the leadership in Beijing. Indeed, for doomsayers, China’s unrelenting stance in the South China Sea has already severely damaged its global standing and will now likely pose a greater risk to its long term security and interests. Combined with a struggling economy characterized by a volatile stock market, capital flight, and bad credit, it may only be a matter of time until the Chinese debt bubble bursts. While Beijing’s gross domestic product unexpectedly expanded in this year’s first quarter, these statistics too may be overstated for political reasons or sometimes outright manipulated. Put all that together and it seems like China is facing a bleak future bereft of any real allies in the region and the possibility of an unprecedented economic downturn. That scenario, however, may be vastly overstated. Beijing has several aces up its sleeve, chief among them being Xi Jinping’s “One Belt, One Road” (OBOR) initiative. OBOR could not only be a boon that eases China’s economic woes, but also relieves regional political tensions and lubricates some of its relationships, including with Russia. OBOR’s primary purpose is to trigger economic development in China’s poor inner regions through contract handouts to state owned enterprises (SOEs) in the infrastructure, energy, and manufacturing sectors. On a recent state visit to Uzbekistan, Xi made the point that this modern-day Silk Road is taking hold, claiming Chinese trade with countries participating in OBOR exceeded $1 trillion last year, while Chinese firms invested nearly $15 billion in OBOR countries throughout the same time period — a pittance compared to the $4 trillion Beijing promised to shower on the 40 countries connected by the trade route. A long term project like OBOR is both an exercise in diplomacy as well as an attempt to alter the way one looks at the global economy and the balance of power. Beijing’s vision is one in which China takes center stage in a massive trade network reaching from often neglected central Asia to Central Europe. With 900 official deals underway sporting a combined worth of $890 billion, the massive trade and investment effects across Eurasia could well reshape a significant part of the global economy. China’s investment program into OBOR states helps its SOEs to stay afloat, modernizes Beijing’s productive potential, and creates a level of welfare in tune with the CCP’s stated goal of becoming a “moderately well-off society” by 2020. Finally, OBOR might help China to increase its global influence and offset risks stemming from the U.S. pivot to Asia and setbacks in the South China Sea. With that broader geopolitical perspective in mind, OBOR’s role in boosting Sino-Russian relations should not be neglected. In a report published last year, various Russian experts argued that the intersection of Russia’s own economic project, the Eurasian Economic Union (EEU), and China’s OBOR “creates the necessary conditions for the interpenetration and integration of the EEU projects and the Silk Road Economic Belt.” The report added, “From an economic point of view, there is no contradiction between these two formats – on the contrary, they complement each other[. ]” The report was a sign that the traditional skepticism in the Russian establishment toward OBOR may be being replaced by a rising new group of strategic optimists. 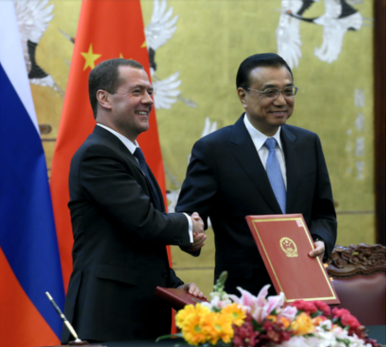 Russia increasingly wants in on the action, and, consequently, Sino-Russian relations have begun to improve. While it may not come as a surprise that Russian and Chinese media paint bilateral relations in a positive light, it is also no coincidence that the leaders of Russia and China expressed their desire to strengthen ties. Russia – which has traditionally wielded influence over the smaller Central Asian states that form key pillars of OBOR – is important for China in the region, because its cooperation with China could be crucial for the Silk Road project to succeed. On the economic front, China is providing financing for a $21 billion high-speed railway project connecting Moscow with Kazan in Russia’s central West. The project is expected to be the first leg of a future $153 billion Moscow to Beijing track. In a June state visit, Putin inked 58 business initiatives worth $50 billion including the sale of stakes in various Russian projects to Chinese firms, an oil supply contract, as well as joint investments in petrochemical initiatives in Russia. There are also talks of major infrastructure projects, such as building a 70-kilometer “hyperloop” line along the Pacific Coast to connect Russia’s port of Zarubino with China’s Jilin province. Just as Russia looked east towards China to make up for the economic fallout resulting from sanctions in the wake of its incursion into Crimea, China is now looking west as it gets shunned in Asia. Though OBOR is a project that is still in the works, it seems to be an important part of how both countries are trying to boost ties.